Cystic fribrosis is a condition where the lungs, liver, kidneys, intestine and pancreas are affected. It is a genetic disorder. This condition can affect both adults and children. Early detection is key so that the symptoms are relieved and treated. Unfortunately, there is no known cure for this condition. 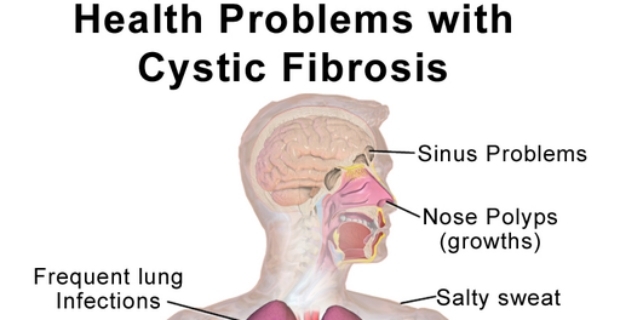 We tell you cystic fibrosis symptoms in adults. An adult affected with cystic fibrosis may have salty-tasting skin. If you have the genetic disorder, you may fail to thrive even if you are eating properly. There might be a persistent cough accompanied by thick mucus. Those who are affected by the disease are more likely to experience lung and chest infections. This is because there is a continuous build up of bacteria in the chest which can lead to infections. The digestive tract of adults is also affected causing bulky and smelly stools, malabsorption of nutrients and even diabetes. Adults who have cystic fibrosis are also prone to developing sinuses as well as ear and nose problems. In addition to the above, sufferers may also be infertile. In men, the tubes for transporting sperm are underdeveloped and in women, there might be thickening of the mucus preventing conception. Other causes include low weight and irregular menses. Other adults can also develop problems with the liver as the bile ducts are blocked by the mucus. In serious cases, it might even require a liver transplant. Treatment and management of cystic fibrosis depends on the severity of the symptoms and early detection, but may include use of antibiotics for bacterial infections, pulmonary rehab, chest physiotherapy and lung transplantation.